The original Hollandaise Sauce Recipe requires a cook to use a wire whip (or whisk) in a continual and vigorous manner. The method can be a little time consuming. This is an alternative method for making Hollandaise Sauce for you to try. It uses a blender instead of a whisk or whip. Preparation time: 2-3 minutes. Makes 1 cup or four 2 ounce servings. 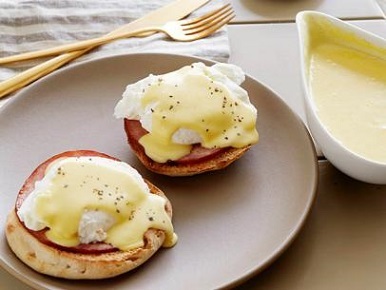 Serve your Hollandaise over vegetables, poached eggs, seafood or meats. It's great! 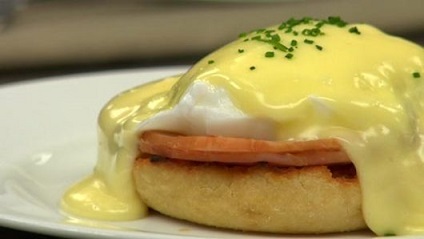 For a Hollandaise sauce that uses a whisk instead of a blender, click here. Enjoy your Hollandaise Sauce and the company of those you share it with! Did you know? 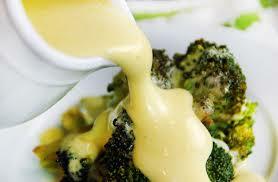 Hollandaise is one of the five sauces in the French haute cuisine mother sauce repertoire. It is so named because it was believed to have mimicked a Dutch sauce for the King of the Netherlands' state visit to France.